In 2011, 34% of 8th grade public school students nationwide performed at or above the proficient level in math, a sizeable increase from 27% in 2003. Among the states, there were sizable differences in the percentage of 8th grade public school students scoring at or above the proficient level on the NAEP science assessment, from 19% in Alabama and Mississippi to 45% in North Dakota. Of the 51 jurisdictions that participated in both the 2003 and 2011 NAEP assessments, 43 showed increases in math proficiency among public school 8th graders during the period. Only 25 showed a significant increase from 2007 to 2011. 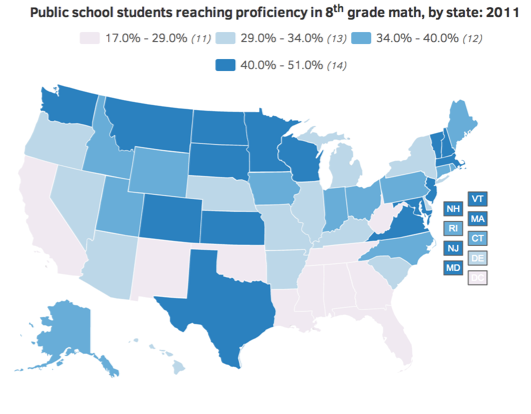 Only Massachusetts had more than half of its students scoring at or above the proficient level in math. 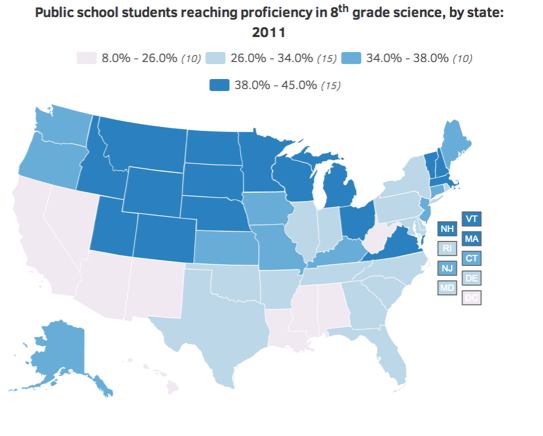 Most states had less than 40% of 8th grade students performing at or above the proficient level in science.